What can you get for $14.3 million in the old rich Arab Emirates? Just a plain car license plate with No 1 printed on it. Not as if its made of gold or platinum embedded with diamonds. Its just a plain simple license plate evidently presented above with the label No. 1. 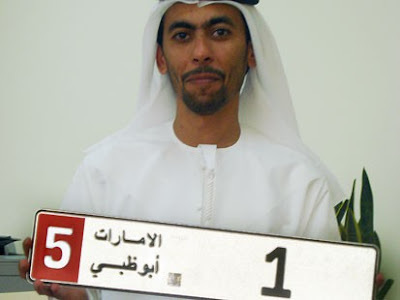 Guess the rich Arabs are going after vanity plates now in a world record fashion. The old world record was held by other rich Arab, stock broker Talal Khouri who had bought it for $6.8 million in an auction. Frankly i see nothing more than just pure ego and a way of showing off. They can certainly put such good money to better use. If Bill Gates and Warren Buffett could give all their hard earned wealth for the good of humanity, I cant see why the Arabs cant do the same from the wealth that they had acquired from the natural resources of the world. They should give back more from what they had taken underneath the earth.